The possibilities for scrumptious peanut creations are endless with our super extra-large Raw Virginia Peanuts. A recipe folder is included with each bag of raw peanuts for those who like to cook their own. OU Kosher Certified. • Fiber and Protein. Both of these nutrients are designed to help you stay fuller for longer after eating. In addition to that, they help to support your immune system. They provide amino acids that are necessary for growing healthy tissue and maintaining the tissue. The fiber found in raw shelled peanuts can help regulate your blood sugar and lower your cholesterol. Eating foods that are rich in fiber, such as raw peanuts, can help reduce your risk of cardiovascular disease and type 2 diabetes. • Copper and Magnesium. Raw peanuts also have a high level of copper and magnesium which is great to have in your diet. Copper helps your immune system function as it should. It also helps nourish your bones while strengthening them. The copper that is found in raw shelled peanuts helps to promote muscle function while also helping your cells produce energy. • Folate and Vitamin E. Folate is also known as vitamin B-9 and this vitamin, as well as vitamin E are both found in raw peanuts. Both of these vitamins help with disease prevention and together they provide ample benefits. Vitamin E helps to fight free radicals that can contribute to cancer. Folate helps to lower homocysteine levels. A high level of homocysteine is directly connected to cardiovascular disease. In addition to helping fight disease, vitamin E also boosts red blood cell development while folate helps to support new cell growth. Next time you want to get peanuts for a recipe or if you want to cook them yourself, consider purchasing raw peanuts. It will not only be a good change for your regular diet and nut intake, but you can enjoy all of these health benefits that are associated with them. You can eat them as a snack after roasting them or add them to some of your favorite recipes. There are so many options for you to add them to your diet. 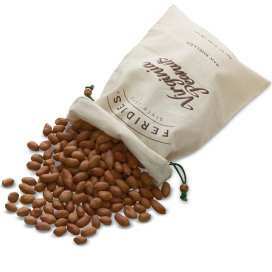 Try some of our roasted peanuts today and discover the difference for yourself. Our peanuts may just become your favorite new snack.